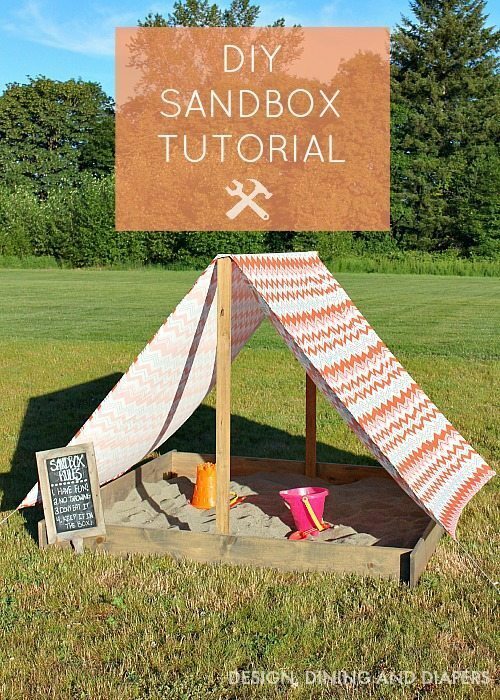 One of the things our kids have been asking for lately is a sandbox for our backyard! 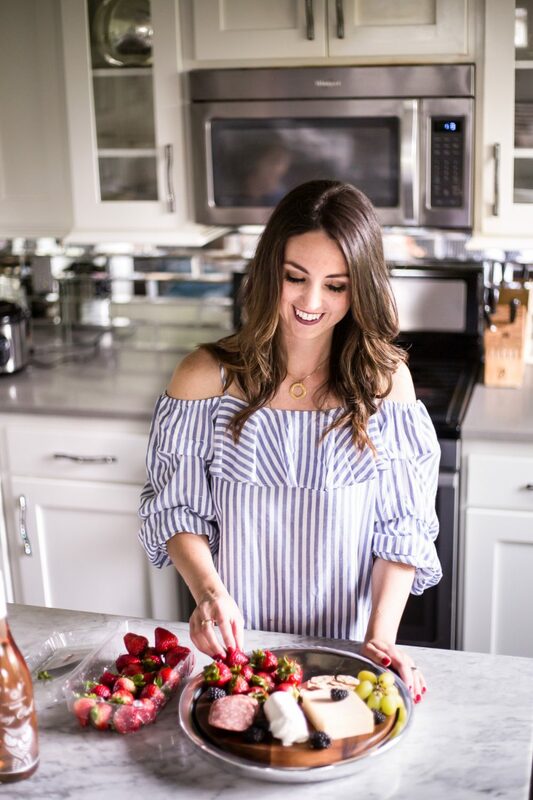 It was one of my favorite things to play with growing up and I’m excited for our kids to build their own memories. 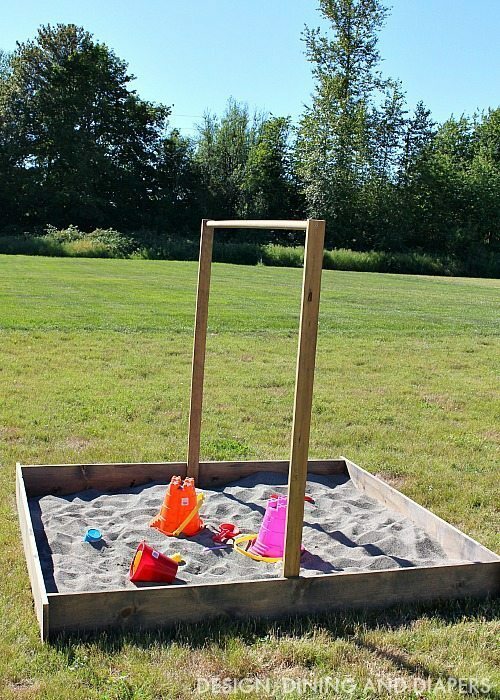 With all the nice weather we’ve been having I finally got around to building their DIY Sandbox With Cover and they are so excited with how it turned out! And so are we. I chose to build a pretty basic sandbox and then added my own spin to it. You can find a basic build over on the True Value DIY Site. 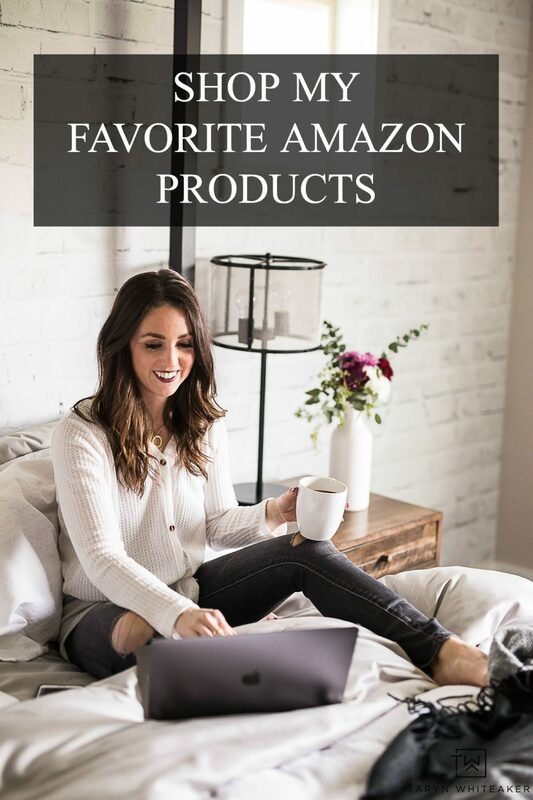 This has great tips for getting ready to build your own. I originally started to build a 4X4 box, but then realized how small that really is and both my kid’s wouldn’t fit happily in there (I don’t need any sand fights, ha)! So I started over and went with a 6X6 and it’s perfect! Our backyard is a big open field and the sun just beats down on it all day. We have zero shade on our property and it gets hot. Knowing the kiddos will be playing in there during peak sun times, I wanted to provide some sort of shade. I decided on making a tent-like canopy to help block the sun and cool it down. 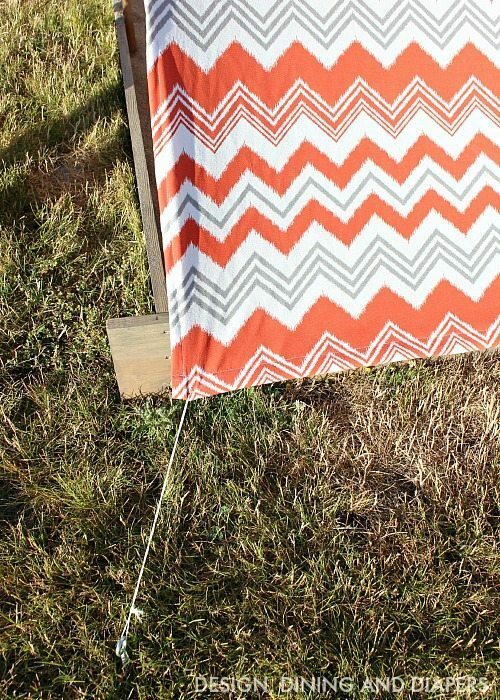 The fabric I chose is made for the outdoors and has UV protection, and if it gets wet, it won’t mildew. This was really important for me, especially since we live in Seattle and tend to get unexpected drizzles throughout the summer. 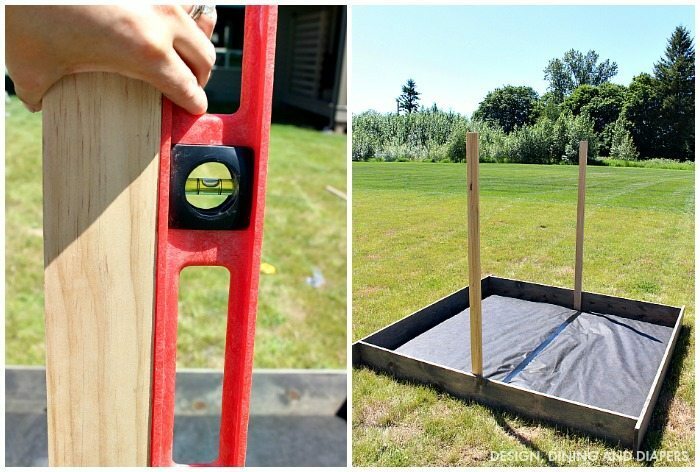 To build the frame, I started used the 1 X 8 X 6″ pieces of wood and screwed them together using wood screws. I put three screws at each joint. You can see in the pic that I placed the boards 2 3/4″ from the outside. There are so many different ways to join together the corners, this worked for us and the look we wanted. I wanted the wood to match our outdoor table and patio, so I gave it a coat of my favorite stain mix, using Minwax Classic Gray and Dark Walnut. 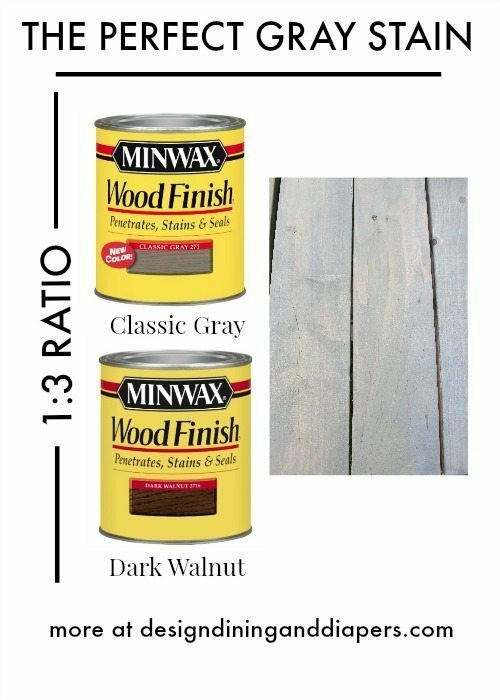 Jus keep in mind this ratio will look different on different types of wood depending on how porous they are. Sometimes I have to use a little more gray and a little less brown. Just test a small pieces first. You will also want to give it a protective coat of polycrylic. 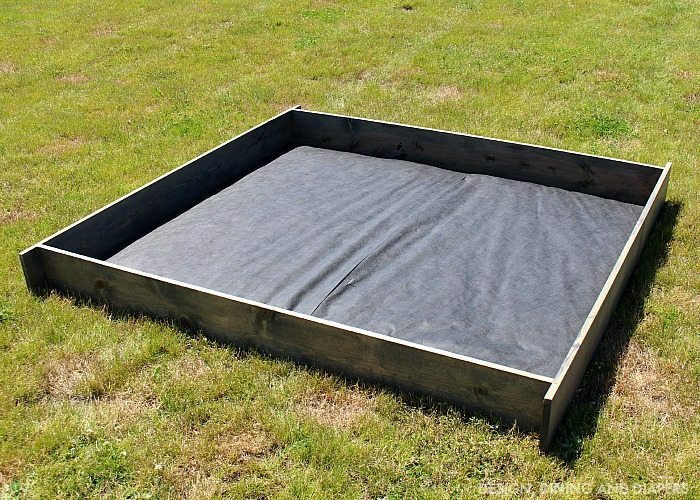 Once you have your box frame built and stained, line the bottom with weed barrier. We did this to prevent weeds from growing through and moles from popping up. At this point, we put the sandbox right where we wanted it and got started on the final steps. Also of note, because I used a 3′ roll of weed barrier, I had to do two layers. Just to be safe, I added a strip of industrial tape to hold the seam. If you want to add the tent portion, keep on reading. I secured two pieces of wood at the halfway point on the sandbox base. Make sure to use a level to keep the posts straight. I secured the screws on the inside to make it look a little nicer on the outside. Then, add the dowel in-between the posts. To fill the sandbox, I picked up (15) 50 lb bags of Play Sand. 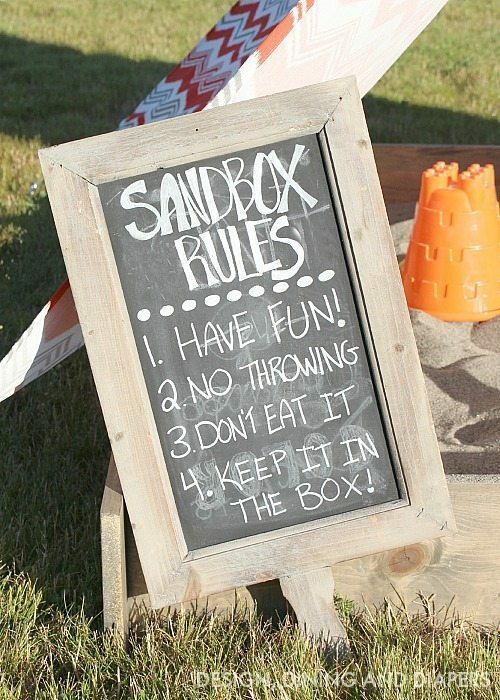 This sand has already been washed and treated and is perfect for a sandbox. 15 bags filled it about halfway, I think we could definitely add more but this works just fine for now. I made the tent using UV/Outdoor fabric. I wanted quality sun/weather protection so I chose to spend the extra money. This specific fabric cost me $13/yard but having the added protection was worth it for me. 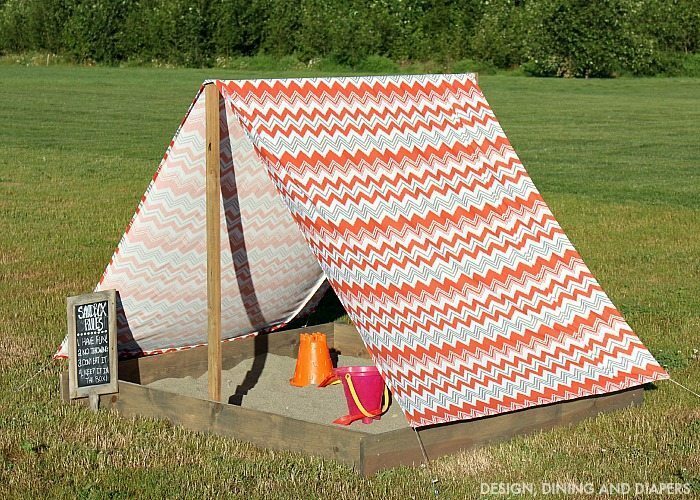 The tent is simply one large rectangle. 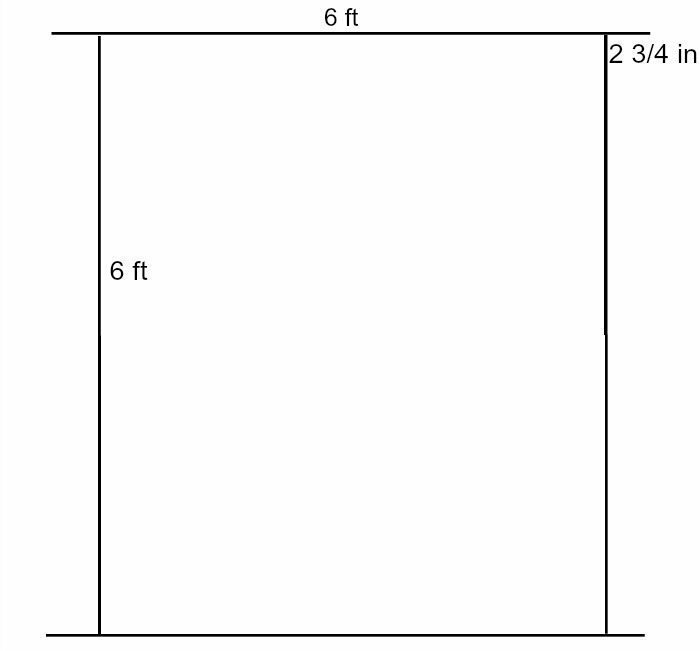 It measures 65″ wide by 136″ long. When making yours, be sure to factor in a couple of extra inches on either side for the seam. 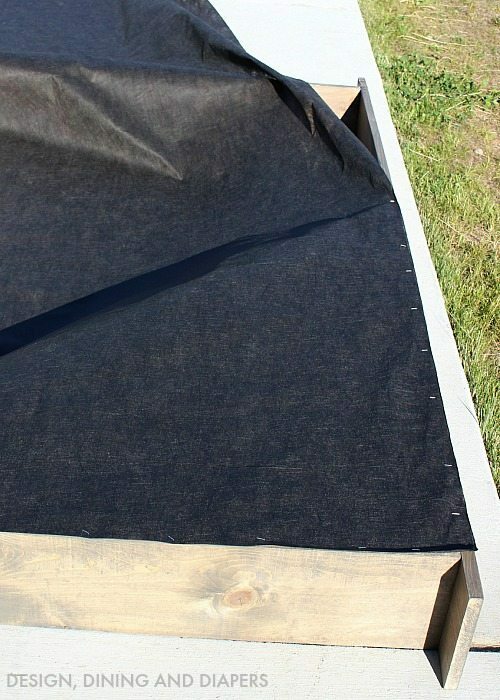 The outdoor fabric I bought was 52″ wide, so I had to add another foot to the width to cover the dowel. Much like you would with a camping tent, I tied nylon rope onto each corner (about 8″) and attached it to a 4″ loop hook. I simply pulled each corner tight and hammered each corner into the ground. What a great idea! And I love that you mixed the stain to get a warmer grey! So pretty! this is such a great idea! Perfect for hot days and yards with no shade! 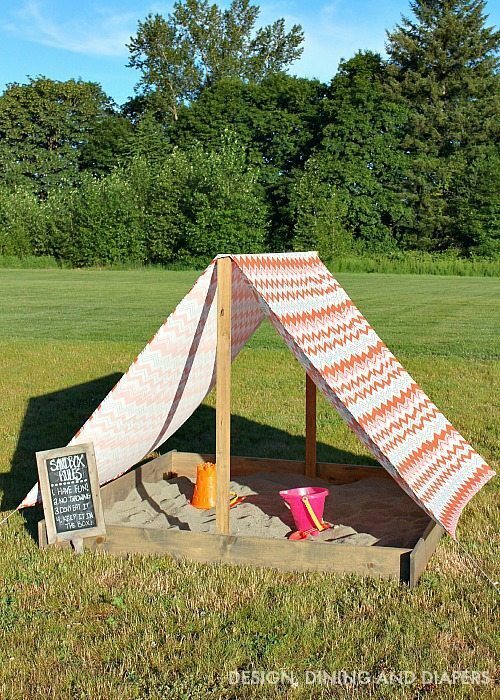 We don’t get any shade in our yard either and I’m loving this whole idea. What a cute project! Would sand wash away in the heavy rain/ snow? Do I need to refill the sand every year before summer?